This Device Lets You Order A Pizza With The Push Of A Button : All Tech Considered It's midnight, and you're hungry. If picking up the phone or using an app is too much hassle, a new innovation has you covered. You could call it "the emergency pizza button." Parts for the PiePal were 3-D printed. If you've ever found yourself hungry at midnight, and ordering a pizza by phone or an app feels like a step too far, the PiePal is for you. It's a gadget that will instantly order you a pre-programmed Domino's pizza with the push of a button. PiePal is from Washington, D.C.-based iStrategyLabs, a digital strategy firm that has previously rolled out "social machines" — devices rigged for a social media hashtag or Foursquare check-in to trigger a purchase or other action in the physical world. Now, they've moved onto an invention that doesn't depend on doing any social media work. "What do people get late at night, what is something you don't want to use an app for, what is something you just want to hit a button for? Pizza," says iStrategyLabs' chief marketing officer, DJ Saul. Already, we came up with a few possible hazards of a device so simple. What happens if people just bump into the button, or a dog or baby presses it again and again? Buttons can be irresistible. Saul says the next iteration of the PiePal, if there is one, will have a clear acrylic case that requires two keys to turn to access the box. 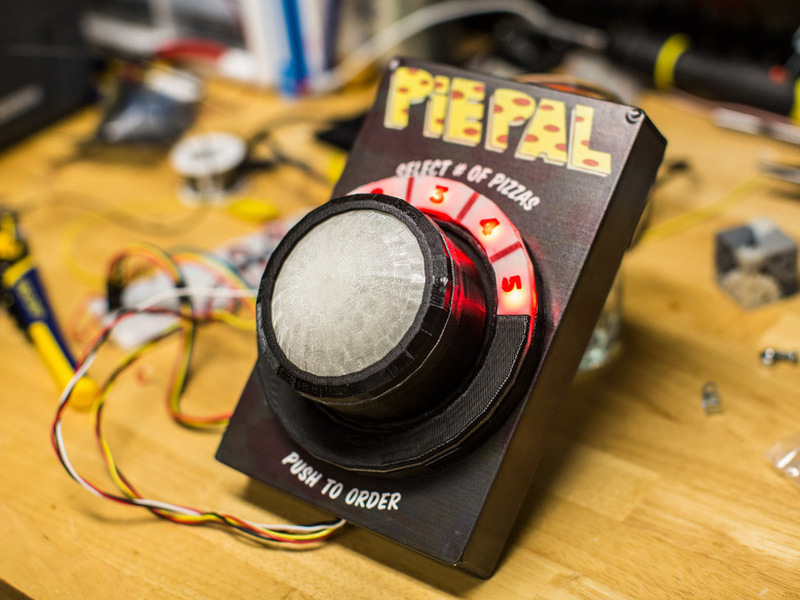 PiePal makes ordering pizza so easy that it needs a safety mechanism. "This is not a client project for Domino's," Saul says. "We know zero people at Domino's. We just used their ordering infrastructure because they have the most sophisticated online ordering structure of any of the major pizza chains. So anyway, you create an account with us and key in your mailing address and billing info, and select the one order you want to get over and over and over again." You can't purchase a PiePal for now, since it's just a working prototype. The company is weighing interest and demand to decide its future. "It could be something for us to deploy at parties, or in theory we could technically produce this. The most exciting thing about this is a connected button. You could tie this to anything," Saul says.